The Tetra Classic Aseptic package’s modular design makes it easy for upgrades. TETRA Pak International has announced global availability of its Tetra Pak A1 packaging line, enabling manufacturers of juice, nectars, still drinks and dairy drinks worldwide to package their products in the instantly recognisable tetrahedron shaped Tetra Classic Aseptic package. The Tetra Pak A1 packaging line meets customers’ high demands for capacity, performance and quality at a low investment. The new line produces 10,000-13,000 packages per hour, depending on volumes and has design correction and PPH for all volumes and a modular design for easy upgrades and volume conversion kits. The Tetra Pak A1 packaging line produces Tetra Classic Aseptic packages in sizes from 65ml to 200ml. It is suitable for several liquid food applications in markets where cost is as decisive a factor as eye-catching package shape. Manufacturers can produce various package volumes, according to local market needs, with or without the addition of a straw (using the Straw Applicator 1 for TCA). In markets where high labour costs are an issue, the TCA Soft Tumble Packer can be combined with the filling machine to achieve a higher level of automation. The Tetra Classic Aseptic package’s original shape helps the customer’s product to stand out from its competitors in eye-catching displays. It is ideal for on-the-go consumption, appeals to younger consumers and encourages impulse purchases. The Tetra packaging was a hit back in the 1960s when it was originally launched in Europe and today this unique package is proving popular the world over with drinks producers and consumers alike. One billion Tetra Classic Aseptic packages were sold last year and this year the amount is expected to double. Tetra Classic Aseptic packages are distinctive, safe and economical. Their tetrahedron shape is pleasing and unusual, making for instant product recognition. 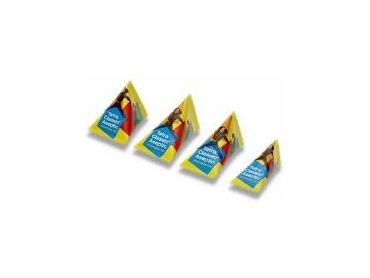 They are simple to produce and use a minimum of packaging material for a maximum of content. Moreover, the aseptic packaging material and process are hygienic even in hot and humid climates, where they can safely be displayed outdoors all day long at retail locations.